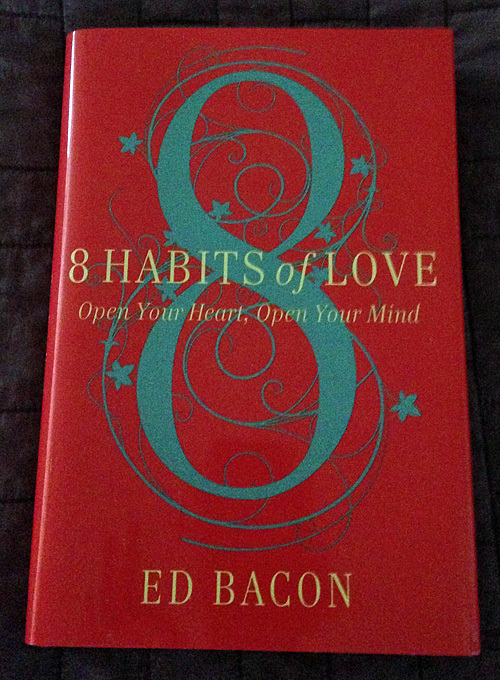 The first habit Ed Bacon talks about in The Eight Habits of Love is generosity. What I did not expect was how closely gratitude is linked to generosity. I am not a morning person. Motivation to get out of bed is hard to find, I always want a few more minutes of sleep or dozing or even lying there cozy under the blankets. Ugh, getting up. After reading the chapter on generosity, I woke to my usual grumbling internal monologue and thought, no, wait a minute, and mentally listed several several things to be grateful for, very basic things like a roof over my head, hot water for a shower... The grumbles were gone and I was out of bed and headed into my day with extra energy. Ann Voskamp also links generosity and gratitude. Ann has been writing about gratitude for a long time, writing down list upon list of things to be grateful. Her book One Thousand Gifts: A Dare to Live Fully Right Where You Are was transformative for me. I followed her example and wrote gifts even on the darkest days, the smallest moment becoming a moment to find joy. Today, I try and linger in those moments of joy and grace. My spiritual director has suggested writing down the fruits of my contemplation (not that I’ve been very contemplative lately — more on that in a future post) which is also turning out to be an exercise in gratitude. “...there’s a perfect love that casts out all fear, there’s an immoveable truth that we are a people of Love, not fear, and there’s not an attack of the enemy that can make the people of the Cross cower in fear and hate and close their doors to Love." “... the Giftivists are the activists who believe that radical acts of generosity counter radical acts of inhumanity." I was, and in many ways still am, a selfish person, but I have noticed that I am becoming less selfish. Listing the ways seems to be like tooting my own horn, but small acts of kindness are becoming more frequent and occasionally in opposition to our shrinking household income. On the other hand, I still want the last Tim Tam (link to what they look like because we ate the last of them before I could take a photo. Ahem.). But maybe there is hope for me yet. How has gratitude fed your generosity?